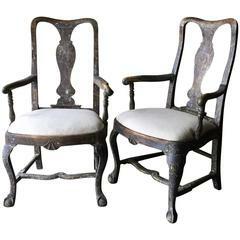 Pair of barrel back chairs, Sweden circa 1890, with rounded form, bronze figural pharaoh head details on handrest and slender tapered legs with bronze fittings. 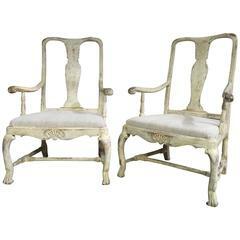 Original worn cream/ white paint finish and new linen upholstery. More than ever, we selected the best, the rarest, the unusual, the spectacular, the most charming … what makes people dreaming! 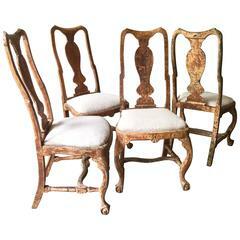 Barrel back caned chairs in beautiful condition. Mid-Century Modern style swivel chairs with barrel backs and suede like fabric. (Please confirm item location - NY or NJ - with dealer).